American film producer Max J Rosenberg, one half of Amicus productions, was born on the 13th of September, 1913, in The Bronx, New York City, to a family of Jewish immigrants. 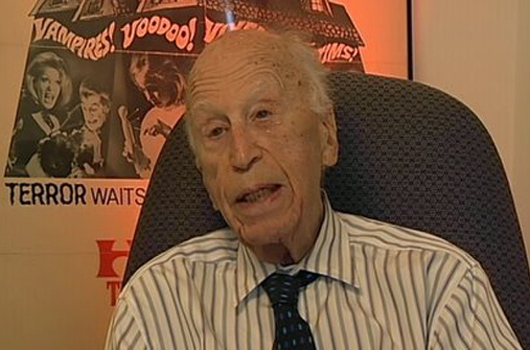 Rosenberg’s career spanned six decades and, although his first film was a musical, together with partner Milton Subotsky, he was responsible for many of English company Amicus’s classic horror films, including Dr Terror’s House of Horrors (1965), The Skull (1965), Scream and Scream Again (1970), The House That Dripped Blood (1971), I, Monster (1971), Tales From the Crypt (1972) and The Beast Must Die (1974). He also produced Dr Who and the Daleks (1965) and Daleks’ Invasion Earth 2150 AD (1966). Rosenberg also co-produced (with Anthony Hinds) Hammer’s The Curse of Frankenstein (1957) but was uncredited for this. Rosenberg and Subotsky founded Amicus in 1962, and the company came to rival Hammer in both output and quality, oftentimes featuring both Peter Cushing and Christopher Lee as leads in its productions. One of the films Rosenberg was most proud of was his 1968 version of Harold Pinter’s The Birthday Party, which starred Robert Shaw, and was directed by William Friedkin. He continued to work well into his 80s, his final film being Perdita Durango in 1997, also known as Dance with the Devil. Max J Rosenberg died in Los Angeles, California, on the 14th of June, 2004. He was 89 years of age. Just watching tales from the crypt. I’m a max too! !